GT once stood for Grand Tourer, but not when AMG gets involved. 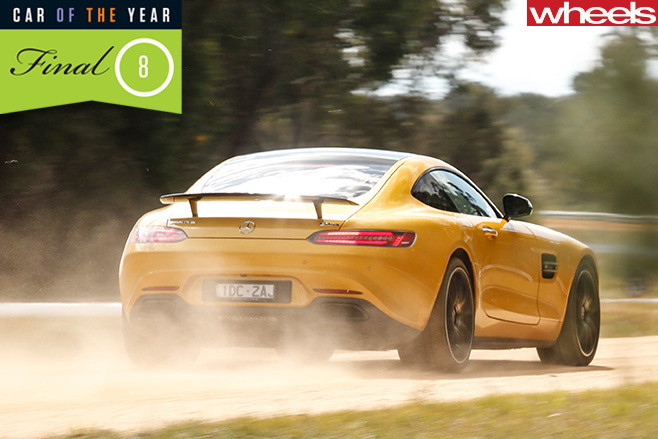 IF THERE was an award for Sound of the Year – and many who drove this bright yellow AMG GT S thought there should be – you’d be looking at the winner. 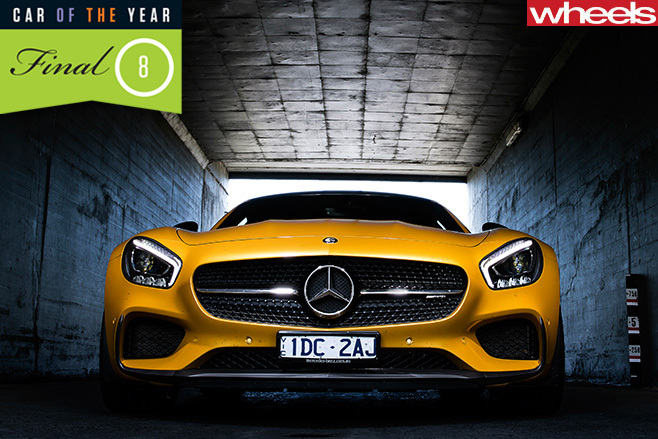 Of the 2016 COTY field, nothing came within a V8 decibel of the AMG’s fuel-gurgling, eardrum-shattering soundtrack, which made even the 5.0-litre V8-powered Lexus RC-F seem timid in comparison. You can forget fears that bolting a pair of turbos onto AMG’s flagship supercar has robbed it of its character. Yet even with the twin-turbo 4.0-litre V8 switched off, the GT S oozes menace, thanks to a design that marries aggression with beauty, especially when viewed from behind. As good as it looks, it’s a credit to AMG’s engine boffins that the one thing that dominates the GT’s driving experience is what lies under its long, wide bonnet. Punching out 375kW and 650Nm from 1750 to 4750rpm, AMG’s front/mid-mounted 4.0-litre twin-turbo V8 is an absolute monster. Flattening the right pedal makes very long straights suddenly quite short, with the GT’s tidal wave of grunt only increasing in ferocity with every cracking upshift from the seven-speed dual clutch. Even better was confirmation that while the AMG GT S is just as ferocious as the old SLS in a straight line (0-100kmh takes 3.8sec), it’s nowhere near as intimidating to drive. The steering is accurate and precise, the suspension firm and flat, and the chassis balanced and predictable. This is a character trait helped by the AMG’s superb ESC calibration. The downside is that such finely honed smooth-road dynamics bring severe compromises. Over Lang Lang’s rough road section, the GT’s ride was unforgiving, and on public roads it’s even firmer. Occupants feel every lump, bump and crease. That isn’t ideal in a car with GT in its name, suggesting it should be able to tour grandly. There are worse places to get pummelled about in. The GT’s cabin is snug and beautifully appointed with a rich mix of materials dominated by supple leather and exposed carbonfibre. There’s little doubt the GT’s rock-star exterior and expensively trimmed interior reflect its near-$300K price. The only interior complaints were a few squeaks and rattles, and the driver select system, which unlike every lesser AMG doesn’t separate the steering setting from the dampers and chassis modes. Slotting the steering in Sport and the dampers in Comfort would be the sweet spot, but it’s simply not possible. Which brings us to efficiency. 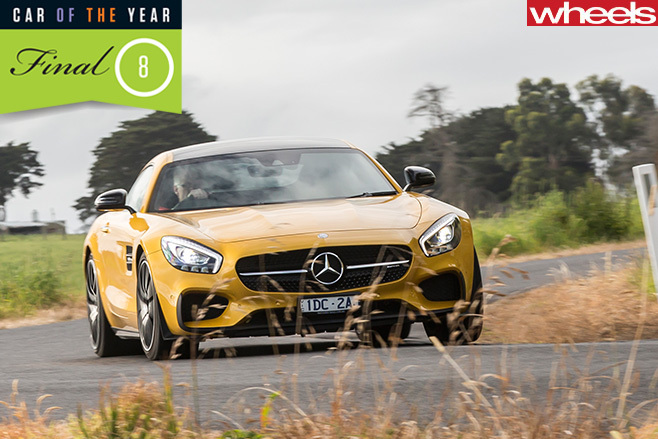 This was never going to be an AMG strong suit, and the GT’s 15.5L/100km road-loop fuel average cemented its place as the thirstiest car of the 2016 field. 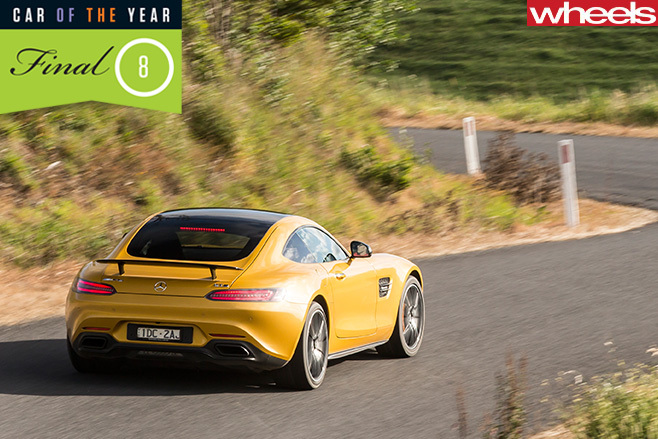 So there are flaws, which is why the AMG GT S fell short of claiming our highest honour. But these shortcomings don’t detract from what is undeniably a brilliant piece of engineering.